Let your cares melt away as you enjoy Breathtaking Valley and Mountain Views of unpopulated National Parks land while rocking on the screened porch, soaking in the large hot tub or relaxing on the 2 decks. The Hideaway has all the comforts of home in this secluded two story true log cabin with porches on both levels, lower 27'x42' deck, fire pit, free wifi, widescreen TVs in the Game Room & main level family room and queen bedroom, Premium HDTV Cable package, movies, 7' pool table, X-Box 360 Elite HD with 12 games, gym membership. The downstairs Game Room, bedroom with KING size bed and master bath gives the young adults the privacy to play the night away, listen to music, watch TV or relax in the hot tub while listening to the sounds of nature & the nearby stream. Enjoy frequent sightings of deer & wild turkey while relaxing on the porch swings, or hiking the nearby Benton MacKaye Trail. The property is located on 2.5+ acres. Antler Ridge Hideaway Cabin: The cabin is a true log cabin, located near the top of Laurel Ridge Mountain (3,000 elevation) in Blue Ridge, Georgia. The views you see in photos are indeed the view from both porches and decks, hot tub and all interior rooms except the twin bed bedroom. The upper level of the cabin has the deck with seating areas, screened porch with swing and rockers, living and dining area, fireplace, wide screened TV, kitchen, bedroom #1 with two twin beds, full bathroom and bedroom #2 with queen bed & TV. The lower level of the cabin has the game area with pool table, laundry room with washer/dryer, another family sitting area with queen sleeper sofa with box spring mattress (sleeping area #3), gas log fire place, wide screen TV, X-Box 360 Elite HD with games and controllers, master bedroom #4 with king sized bed and master bathroom. Off the Game Room area is the lower level porch and the huge 27’ by 42’ deck with seating/rockers/swings, hot tub and a picnic table with umbrella. 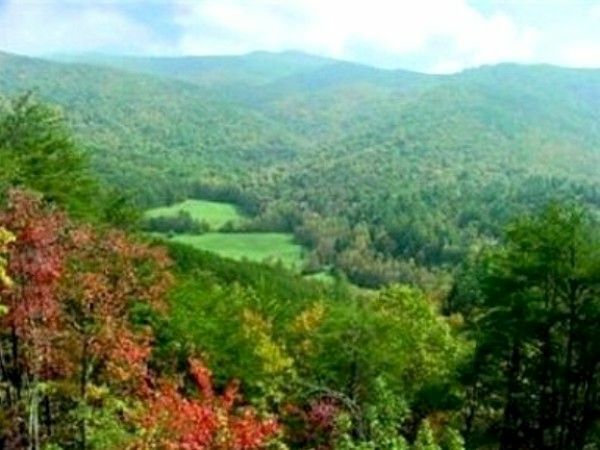 The cabin is on 2.5 + acres, secluded and has mountain views of Rich Mountain and uninhabited national forest lands. It is not in a gated community, nor do you have close neighbors (YOU DO NOT SEE OTHER CABINS FROM OUR CABIN). There is no cabin to our left. The cabin to our right is several acres away and over a hill. You have over 50 acres of “no neighbors”. You do not see the road from our cabin, yet you do not feel totally isolated. Unlike may cabins near the top of a mountain, the Hideaway has plenty of level and sloped land for children, pets and family to walk around, run and play with no sudden drop offs. (3) Widescreen flat LCD/HDTVs in Game Room and main level family room, TV in queen bedroom. HDTV Premium Cable Package. ON LOWER LEVEL COVERED PORCH WITH BREATHTAKING MOUNTAIN VIEW. Pack N Play provided Gym membership for 2. Umbrella Picnic table on lower level porch.8 Adirondack chairs for lounging, benches, rockers and swings. Cabin also has a charcoal grill. Private chef and in cabin massage service available. widescreen LCD/HDTVs. in Game Room, Family Room and Queen bedroom. All TVs have Premium HDTV Cable Package. X-Box 360 Elite HD with 12 games. Enjoyed our stay but directions were confusing. Glad we had GPS. Towels were in dryer. Dish washer hadn’t been emptied. Steep driveway. We thoroughly enjoyed our stay. Perfect for the family and great location. Looking forward to coming back in the future! Perfect getaway for a quiet and enjoyable vacation. Cabin is equipped with everything you could possibly need. Sandy is an awesome host and shares a plethora of information with you, which makes you want to stay even longer. The views from the porches is heavenly and even better from the hot tub! Our fur babies loved romping and hiking trails. Definitely be returning again to a slice of heaven. The cabin was nothing short of amazing. The view from the deck is wonderful and it’s very quiet. Kitchen is fully stocked with basic utensils which is a great so I didn’t have to bring/buy. It was also pretty child friendly with a pool table and Xbox downstairs. Definitely be aware the steps are steep so young children will need to be supervised going up and down. The cabin was spotless and well maintained. The owners are only a phone call away and are extremely helpful with directions and also gave us a list of local trails, waterfalls, attractions and shops. Cabin was great. Plenty of room for the 4 of us. All the amenities you could want! Owners are extremely helpful with anything you need. Will definately be bqck! Great place to get away and relax! Close to town so you can enjoy a day in Blue Ridge. Secluded so you can really get away and enjoy time without all of the outside distractions. Located near the top of Laurel Ridge Mountain in Blue Ridge,Georgia. Conveniently located an hour from Atlanta. When not just resting and relaxing, enjoy hiking the 'steps away' Benton MacKaye Trail, whitewater rafting, scenic horseback rides, hiking the many nearby mountain trails, boating on Lake Blue Ridge, fly fishing, Amicaloa Falls, the Appalachian Trail and the many local art and antique shops in the pet friendly communities. Ride the Blue Ridge Scenic Railway to Tennessee, enjoy Blue Grass Festivals, Apple Festivals, Arts in the Park, Gold panning, Pickin' in the Park, Symphonic Music on the River, Community Theater, Wine Country Festival, Scottish Festival and Highland Games, Mountain Top Rodeo and mountain biking competitions. Other Activities: Snow-tubing, ATV Trails, Boat Rental. Olympic size community pool, water falls, hiking trails. Theme Parks 1hr. from cabin.